The class for the Yellow Brick Road will run 3 consecutive Mondays February 4th, 11th, and 18th. 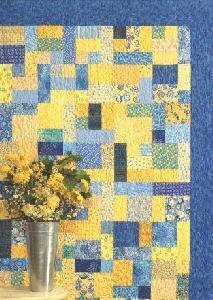 Jan will be teaching you how to make this adorable quilt. Pattern available to be made from Baby, Lap, Twin, Full, Queen and King. Patterns are available at the shop! Class time is 10:30 till 1:00. Cost is $45 for all 3 days! Bring your sewing machine, rotary cutter, basic sewing supplies and fabric! A fun scrappy quilt!